As mentioned elsewhere on this site, NMU is a "laptop university." 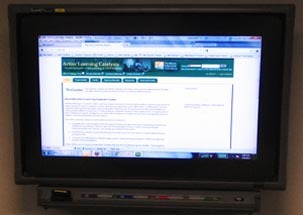 Each full time student receives a leased laptop computer with software as part of tuition. Campus is fully covered by a wireless Internet signal, and a pioneering 4G WiMAX network provides extended off-campus Internet coverage to faculty and students. The educational technology in LRC 108 builds upon this pre-existing infrastructure. The room has some technological aspects in common with high tech active learning classrooms at other universities. Other elements are more unique to the NMU implementation. End-user tools that directly impact teaching and learning. 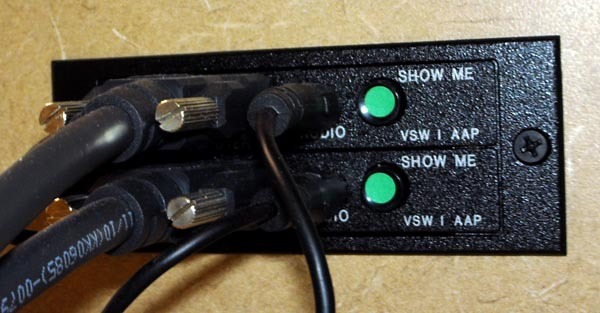 "Behind the scenes" components, such as amplifiers and switchers, that make the end-user tools work. Technology incorporated into the room had to fit into one of those categories; "bells and whistles" were not included. This page focuses on the end-user tools, but a list of "behind the scenes" components is provided at the bottom of the page for those interested in more technical details. Each student table has an adjacent 42 inch widescreen LCD monitor. 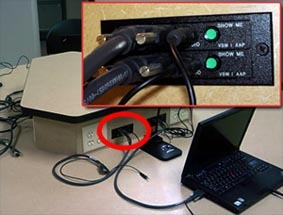 All nine students at a table can plug into a video switching system that allows them to toggle which laptop is displayed on the monitor. This facilitates information sharing and collaboration. For example, students might do Internet searches about various aspects of a problem, then come back together as a group to share and discuss their results. LG M4214CCBA LCD screens were selected for their price, durability, and compatibility with SMART overlays. 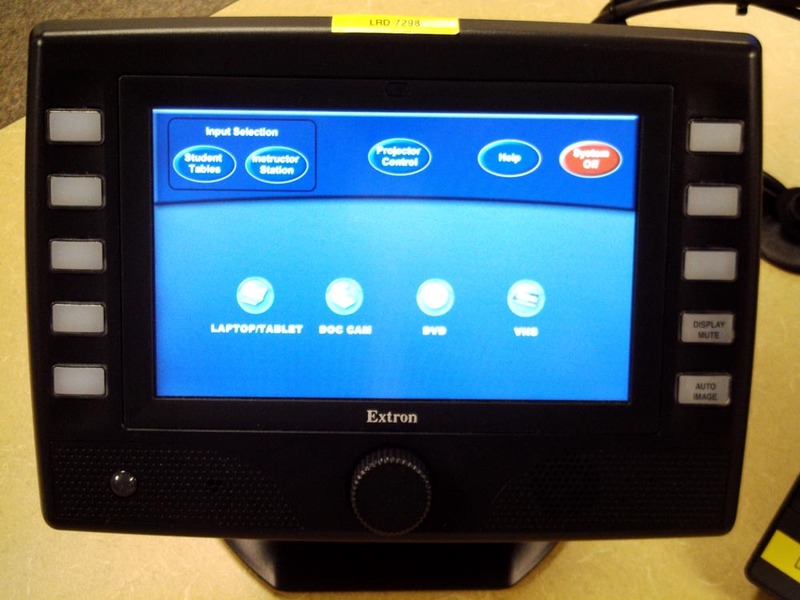 Students toggle which laptop is displayed using Extron VGA "Show Me" buttons. This is an easy-to-use solution that is much less expensive than touchscreen controllers. Complementing the LCD monitors, the room has two ceiling mounted LCD projectors with larger screens on opposite ends of the room. All students have a clear view of one of the two screens without the need to twist around in their chairs. Model B screens. 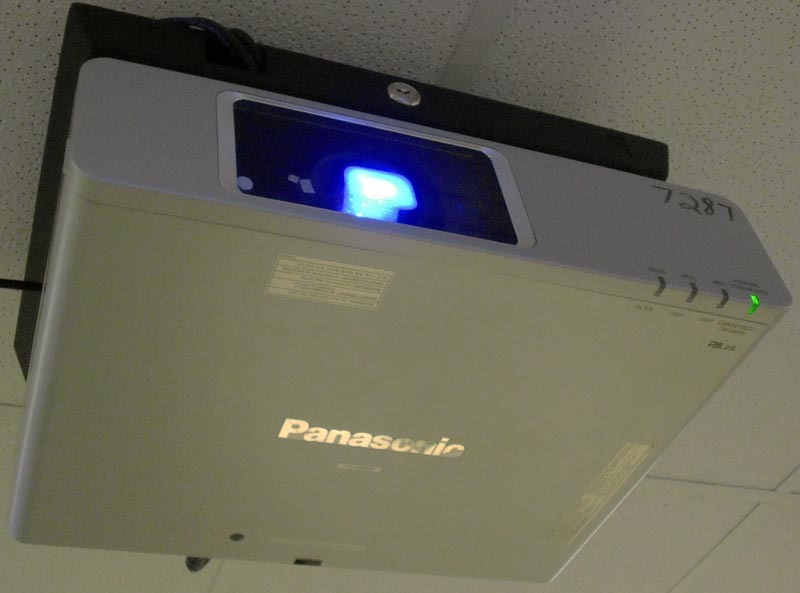 Panasonic projectors are standard in NMU classrooms. The screen is a basic but high quality Da-lite manual pull down model. The instructor uses an Extron touchscreen control panel to select whether the projectors display from his/her laptop or the content from any of the student table monitors. This enables a group's work to be shared with the entire class. 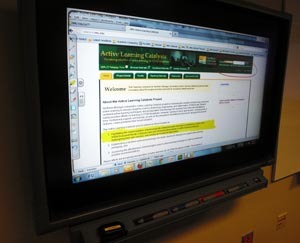 Unlike at the student tales, the complex switching options at the instructor station necessitate use of a touchscreen. display . . . . . . . or a source from the instructor station. 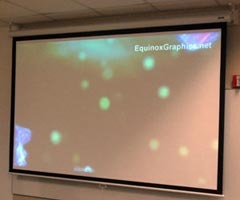 SMART flat panel overlays transform the student LCD panels into interactive whiteboard displays. Using styluses or their fingers, students can interact with and mark up content displayed by a computer. They can also do more traditional white-board tasks such as diagramming and working problems. Notations can be saved for review or additional future work. 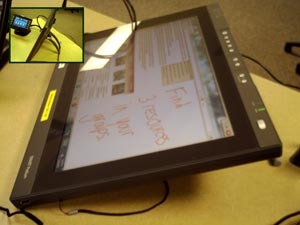 The instructor station includes a SMART Podium 21-inch interactive pen display. 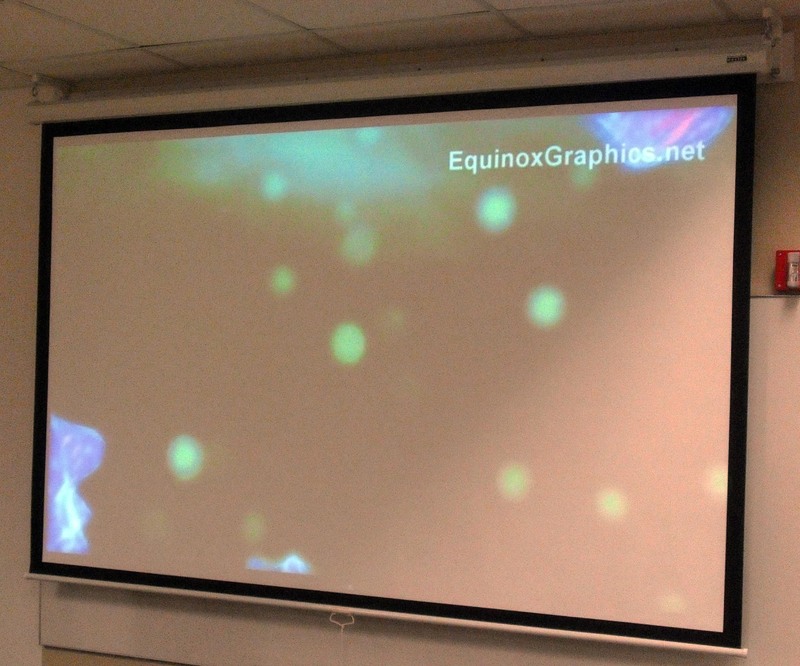 It provides the instructor with most of the same capabilities as the flat panel overlays, but on a smaller surface. When presenting material, instructors write on it rather than on one of the whiteboards, because it is projected to both screens and visible to all students. The SMART overlays have different colored markers and an eraser, just like a low tech whiteboard. The SMART podium is adjustable. Some instructors keep it upright like a monitor (inset), while others prefer to write on it in an almost flat position. 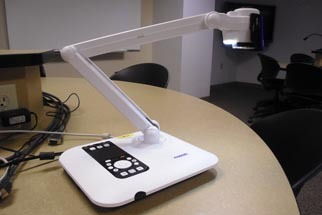 Each student table, as well as the instructor station, has a Qomo QPC60 multimedia document camera. Like the students' laptops, the document cameras are hooked into the students tables' LCD monitors, where they can display live images of microscope slides, documents, models and manipulatives, etc. They can also record still photographs and videos that students may submit as assignments or save for future review. Though designed primarily to point at object beneath them, they can also be used like a camcorder to record student activities such as presentations. 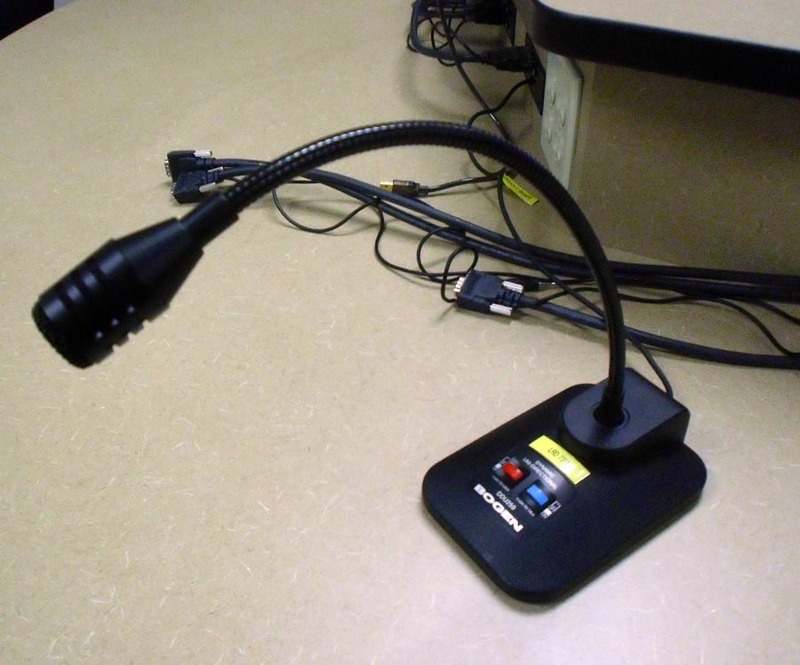 The document camera is portable and has a small footprint, so it can be moved easily to different parts of the table and stored on the center shelf when not in use. Microphones are available for students and the instructor. Each student table has two Bogen DDU250 gooseneck microphones, which can be passed among students. Microphones allow even soft-spoken students to be heard clearly when speaking to the entire class. The project team had some discussion about whether to include student microphones. Larger high tech SCALE-UP rooms commonly have them, while smaller rooms do not; NMU's 63 seat room seemed to be on the borderline. The team decided to include student microphones and get feedback on their use. The instructor microphone is a Shure PGX14-93 wireless unit. It enables instructors to be clearly heard as they move about the room, and allows them to maintain a conversational tone without being concerned about projecting. To activate the microphone, students push and hold the blue button, or lock down the red button for extended talking. 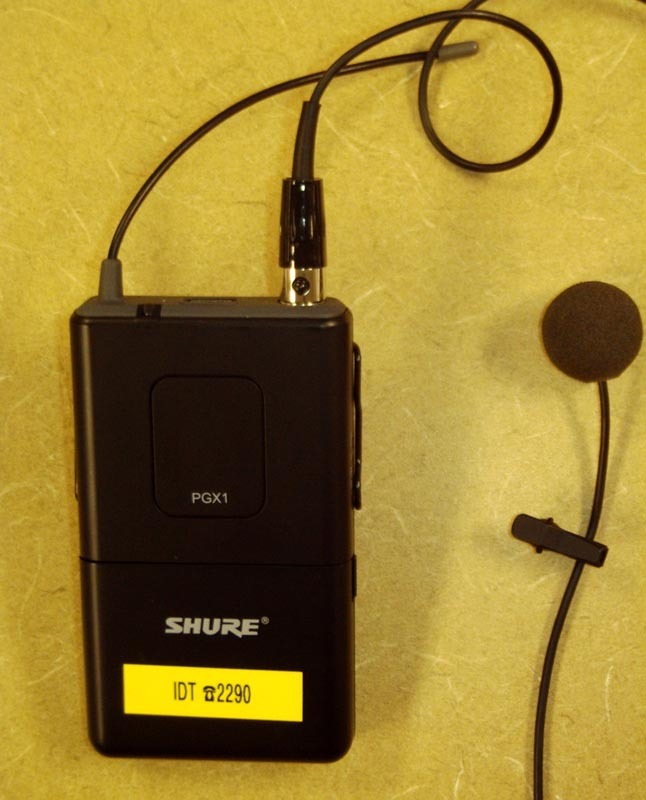 Even instructors with naturally resonant voices may find the instructor microphone useful for getting students' attention when they are engaged in noisy group work. Classroom response systems, where questions are displayed on a screen and students respond with polling devices (often referred to as "clickers"), are often deployed to make traditional lecture format courses more interactive, with the instructor interspersing pools and questions throughout a lecture. However, they are also valuable in an active learning studio environment, where they may be used for informal questions that generate discussion within student groups, team quizzes, brief surveys, and to share summarized results of activities. The NMU team selected a web browser-based response system, Responseware Web, because it fits well with the "laptop university" model. With students already using their laptops in the classroom, it makes sense to also use them for responding to questions rather than introducing a dedicated device. 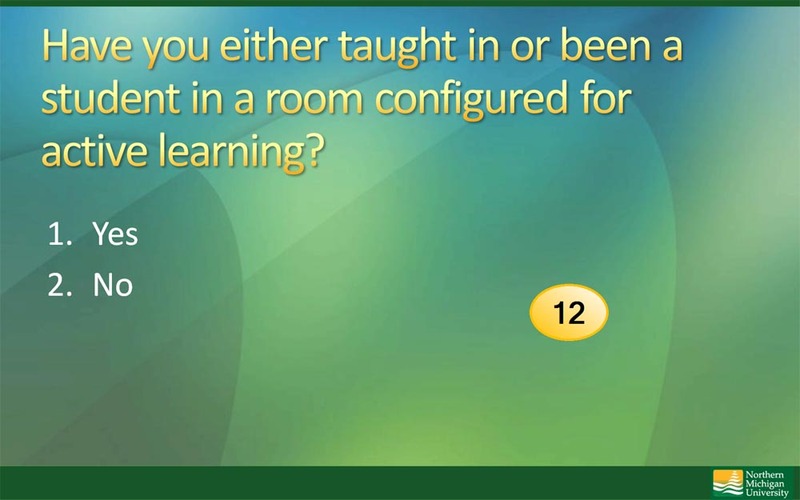 Responseware also allows instructors to ask question types, such as short paragraph questions, that are not easily responded to with clickers. As a question is displayed on screen (usually in a PowerPoint slide), students respond through a web browser. In the example above, an optional countdown timer is displayed. 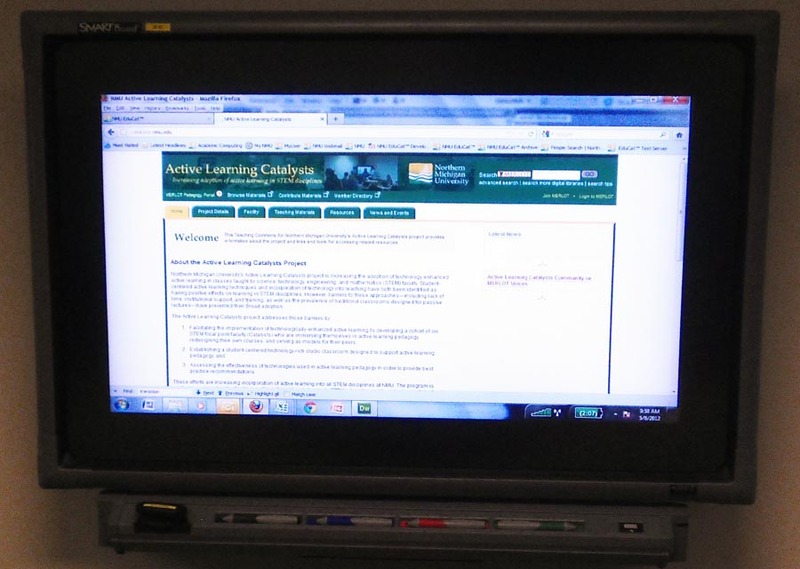 After polling closes, the instructor may display a graph of student responses to stimulate discussion; the graph is also shown to students in their browser window. NMU staff are happy to discuss details of the technical design upon request.